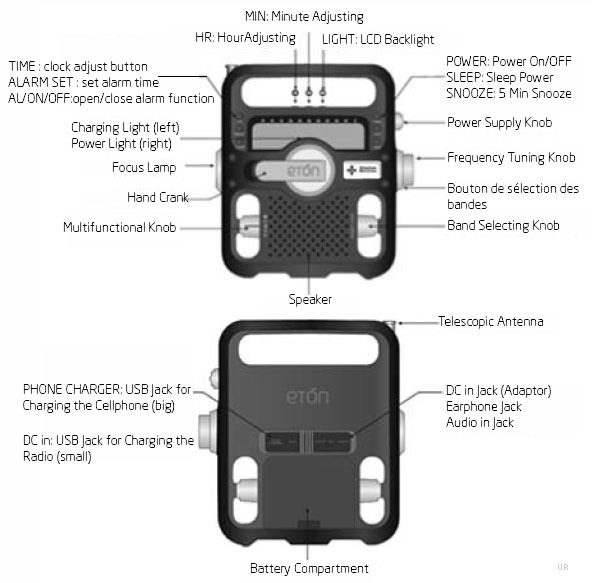 The Eton FR500 Solarlink is just the ticket when your outdoor adventures take you off the grid! You need a device that can fill multiple needs. The American Red Cross FR500 is a compact unit that you can toss in your rucksack and take anywhere. 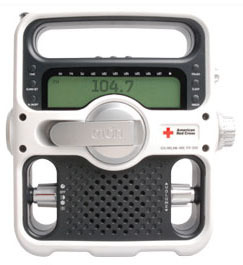 It functions as an AM, FM, and shortwave shortwave radio with NOAA weatherband. It also has a flashlight, an emergency beacon, and an emergency siren. Plus, you can use it to charge your cell phone or MP3 player. This little wonder can be powered with the hand crank, or solely by the sun—solar panels make this a very “green” device. Of course, battery power and AC power are also options. It receives the AM band from 520-1700 kHz, FM 88-108 MHz and shortwave 6000-12100 kHz. It also gets all 7 NOAA weather channels. The controls are easy to use and the digital display is even backlit. Copyright 2008-2011, Universal Radio, Inc.